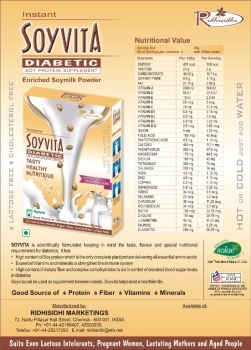 Soyvita soy beverage is a premium quality product fortified with 15 essential nutrients including calcium, vitamin D2 and vitamin B12 - providing a refreshing and nutritious option for Indian consumers. It is a great tasting, easy to use and health promoting beverage. 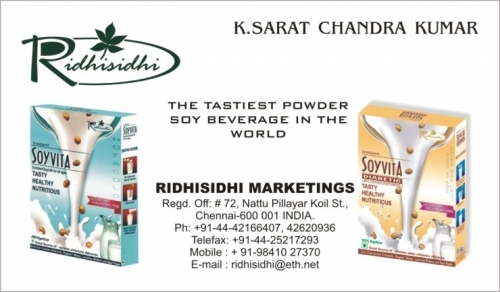 The taste, texture and consistency of Soyvita have been perfected using Solae�s Soy protein. The Solae Company has invested over thirty years of research in understanding the impact of soy protein consumption on human health. Solae� soy protein contains naturally occurring isoflavones and other bioactive components. Solae� soy protein is naturally free of fat and cholesterol. Soyvita-Diabetic is an unsweetened version for people who want to manage their blood sugar levels in a better way and for weight watchers. It has added fibre which along with Soy protein helps in managing blood sugar levels in diabetes. Soy protein is slow to trigger an insulin response, providing a more stable blood sugar with reduced swings from high and low blood sugars. This makes soy an ideal breakfast food for preventing the mid-morning low blood sugar crash in sugar-sensitive people. Adding Soy protein to our diet for getting health benefits is simple and convenient. Soyvita is available in convenient powdered form. Just add hot or cold water and the delicious beverage is ready. Soyvita is lactose-free, gluten-free and casein-free. 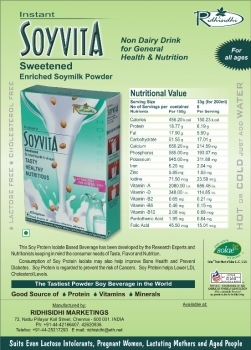 Use Soyvita as a refreshing drink, over breakfast cereal, tea, coffee, shakes etc. � Protein: Each serving of Soyvita provides 6 grams of soy protein. That's one-fourth of the daily amount determined by the FDA to help reduce cholesterol and risk of heart disease. � Fat: Soyvita is low in fat, and the fat that it does have is unsaturated. � Calcium: Soyvita contains as much calcium as cow's milk. In addition, it's fortified with Vitamin D, which helps your body absorb that calcium. � Vitamin A: Soyvita is a good source of Vitamin A, which helps promote a healthy immune system, aids vision and is essential for healthy skin. � Other vitamins and minerals: iron, riboflavin and vitamin B12. To start your day off right, and give you the extra energy and nutrients you need, try blending Soyvita with any seasonal fruit to get a incredibly delicious fruit smoothie.